Can I change the number of pages later on? Yes, you can change the number of pages later on. Edit the number of pages by using the ‘Add 4 pages’ and ‘ Delete last 4 pages’ buttons. New pages are added to the bottom of the page. 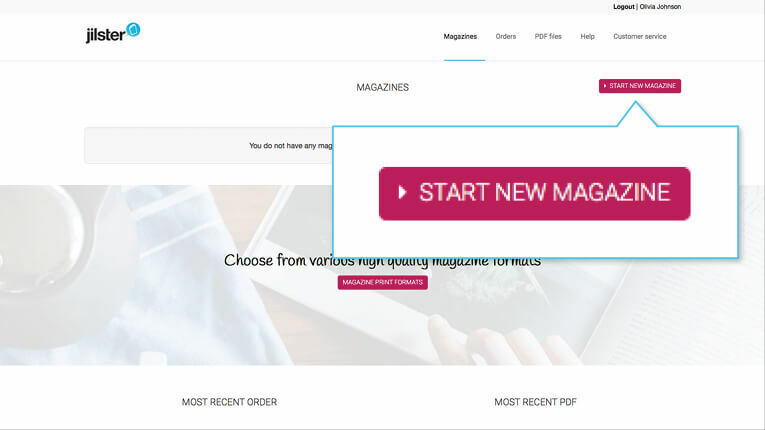 To delete a page in the middle of your magazine, start by moving the page you want to delete to the bottom of the magazine using the ‘Change page order’ button. Then use the ‘Delete 4 pages’ button to delete the last 4 pages. Pages are always added and deleted in groups of 4. This cannot be changed due to the printing process of the magazine(s). You can delete a page by using the ‘Delete last 4 pages’ button. This will delete the last 4 pages in the magazine. It is only possible to delete 4 pages at a time due to the printing process. To delete a page, move it to the end of the magazine by using the ‘Change page order’ button. Drag the page to the bottom of the list and click ‘save’. Now you can delete the last 4 pages of the magazine. Caution: Deleted pages cannot be restored. I want to delete just 1 page, is that possible? No, it is only possible to add or delete 4 pages at a time. This is due to the printing process of the magazine(s)/book(s). How do I add page numbers? To turn on automatic page numbers, navigate to the settings of your magazine and check the ‘add page numbers?’ box. The magazine will now be printed with page numbers. Page numbers appear in the outside bottom corners of pages. Please note: for technical reasons, page numbers are only visible while editing the page, but not while viewing page previews. The color of the page numbers cannot be edited. If you would like to be able to edit the color, send us an e-mail with your request at customerservice@jilster.com. We’ll know there is a need for this feature and look into adding it in the future. Where is page 2 positioned in a magazine? Page 2 is the inside of the front page (cover page). Therefore, pages 2 and 3 are the pages you see when you open the magazine. You will find the even page numbers (2, 4, 6, 8, etc.) on the left-hand pages. You will find the odd page numbers (3, 5, 7, 9, etc.) on the right-hand pages. The cover is page 1. The back cover is the last page of your magazine. Remember, these pages are included in the minimum or maximum page count! How do I move a page to the cover or back cover? To move a ‘regular’ page to the cover or back cover page, use the ‘My pages’ button. Click on ‘Edit’ on the cover or back cover. Press the ‘My pages’ button. 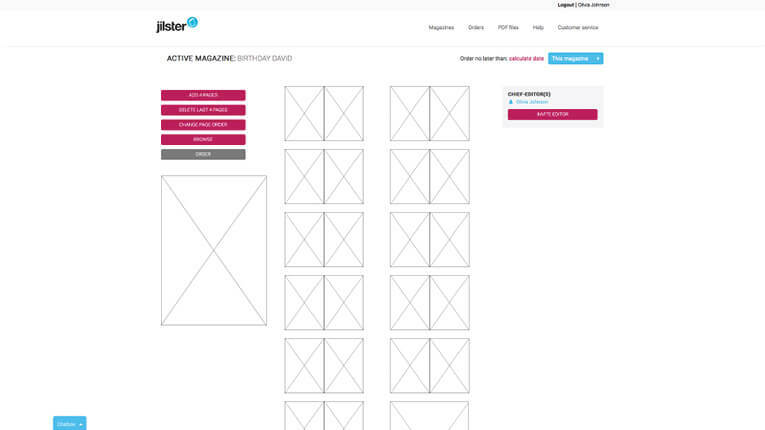 Select the page you want to use as the cover or back cover and click on ‘Use this page’. Can I change the page order once I’ve published the pages? Yes, you can. The page order can be changed at any time. Publishing the page does not prevent you from changing the page order. An editor that has been assigned a page will keep the same page even if it’s moved. An editor is assigned a page, not a page number. Can I change the page order before all editors have finished their pages? Yes. You can change the page order before all the editors have finished, or ‘handed in’, their pages. Editors are assigned pages, not page numbers.So if you move a page, the editor moves along with it. How can I go to the next page? To go to the next page you have to go back to the page overview. From the page editor, click on the ‘back’ button to go to the page overview. From here you can select the next page to edit by cliking ‘edit’ on the next page. How can I ‘leaf’ through my magazine? There are two ways to ‘leaf’ through a digital verion of your magazine. Click on the ‘Browse through magazine’ in the page overview. 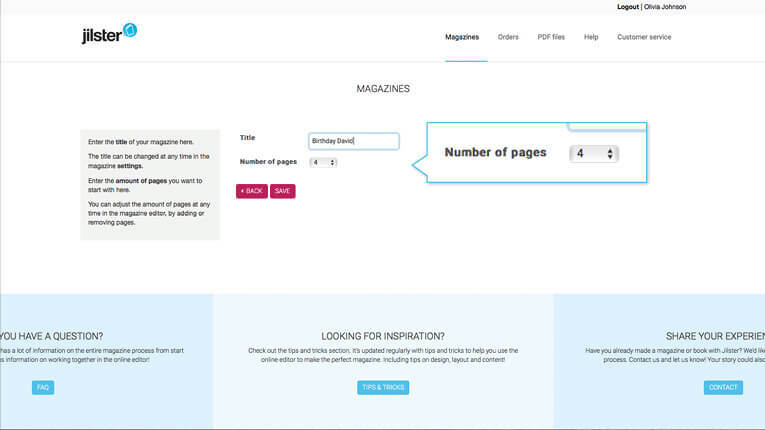 Click on ‘Browse through magazine’ next to the magazine you want to ‘leaf’ through, in the magazine overview. 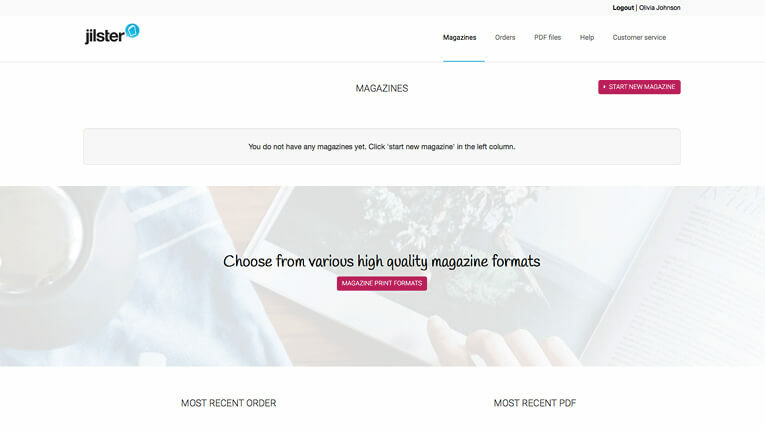 Click on ‘Share’ next to the magazine you want to ‘leaf’ through, in the magazine overview, to share your magazine online. Then click on the jil.st link to view and ‘leaf’ through a digital version of your magazine. What’s the expiration date of my magazine? When a new magazine is started it automatically receives an expiration date. This expiration date is set to one year after the creation date of the magazine. You can update the expiration date of your magazine at any time to up to a year at the future. Example: on February 15th, 2017, you can update the expiration date of the magazine to February 15th, 2018. By updating your magazine’s expiration date you can keep your magazine as long as you’d like. If you don’t update the expiration date of your magazine it will be deleted on the latest selected date. Before this happens you will receive two automatic e-mail notifications, 3 months and 1 month before the deletion date. How can I delete my magazine? You can delete your magazine from the magazine overview. Important: deleting a magazine is permanent and cannot be undone.